In the past implementations, we had actually have a requirements from our customers to implement a spellchecking feature in their CRM system. The CRM does not contain a spellchecking and it will now be introduced in the new version CRM 2016 either, so we must rely on some workarounds and add-ons. In case the users are no so "unified", you can do spellchecking in the CRM app. There are several solutions - like eSpell by MyCRMGroup or Spell checker by MTC. You can try them out. Also, there should be some solution on Pinpoint. For these solution you need to be aware if you are using CRM On Premise or Online. They might not work with both. But why am I writing this article? With Windows 8.1 and later, you have one more option how to implement spell checking. 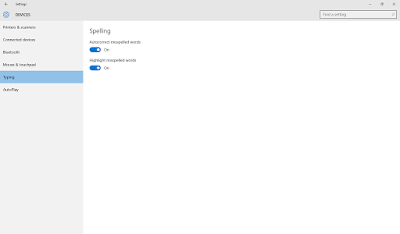 Windows 8.1 and Windows 10 include build-in system spell-checker. It works in all the native Microsoft applications such as Mail, Calendar, Internet Explorer or Edge. Be aware, by default, this feature is ON. It is a global setting, so it does not affect on Microsoft Dynamics CRM, but other apps as well. Thanks for sharing such useful information on Microsoft dynamics which is the most popular open platform operating system. Go with the trendy technology by joining Microsoft dynamics training institute in Chennai to learn from experts. The grammar checker online is the most affordable on the web and this is not because it is inefficient. Nice one, Thanks for sharing your information.